This afternoon (it is Wednesday when I type this), I finished the rough draft of my current novel. Obviously after typing THE END, any further productivity for me for the day went straight out the window. It’s a really weird sensation, typing THE END and being finished. Even being finished with the first draft, which isn’t actually being finished finished. (Revision is my friend.) There’s a sense of confusion and a sense of surprise. Don’t get me wrong: I was fairly certain I’d finish the book either today or tomorrow. But even with that knowledge, the moment of completion is still just the slightest bit unexpected. There is a part of me, when I’m writing a novel, that kind of thinks I’ll be writing that novel and living in that world forever. Writing novels is such a weird experience. It’s a solitary endeavor, especially the rough draft, which I share with ABSOLUTELY NO ONE, and yet I am so focused upon it, and it becomes so real. It’s hard to leave it behind and move on to the next thing, even if the next thing is only draft two of the same book. Anyway, this time around, I figured I might as well live it up, so I proceeded to spend a couple of hours being very excited and chatting with lots of people to celebrate. I knew I could persist in the kind of numb, kind of confused state indefinitely unless I deliberately broke through it and allowed myself to celebrate hitting a milestone. So I danced to my favorite songs and used a lot of capital letters and exclamation points and tried to let the fact of THE END sink in and begin to feel like some kind of reality I can understand and work within. And now I am both very happy and very tired. Tired because I just flung out an outpouring of celebratory energy and because I put as much as I could into this book. I think most of us do. Even books like this one, that are more rollicking and fast-paced and plot-driven. There is something that used to be inside of me, and now it’s there on the page, for better or for worse. I don’t know what I have, of course. That will be the work of the second draft. I don’t know how much works and how much doesn’t work, but I already have a list of things I want to change and fix. What I do have is the experience of writing the book, and overall I had a lot of fun with this one. I reveled in the chance to be writing fantasy again, after quite some time away. I was surprised by exactly how much this pleased me. But when I think of it in my own head, I think of it as my London book. And this book has been a long time coming. London has been my favorite city since I was twenty-one, and I’ve been wanting to write a book set in London since before I started writing books. This is that book, or at least the first of those books. It is a love letter to London, albeit a somewhat strange, magical, and dangerous mirror version of London in the Underworld. And getting to write it has made my inner writer sing. 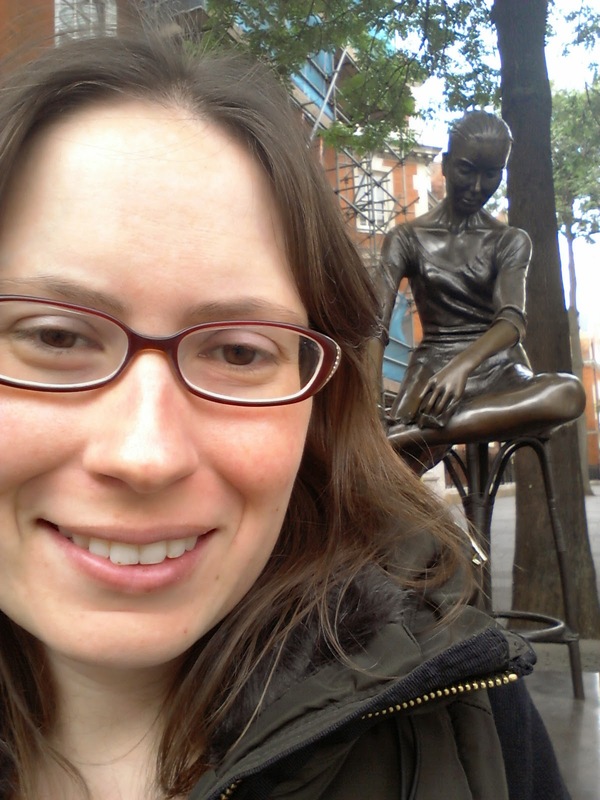 Me in London last summer, with my favorite statue, which inspired one of the characters in my book. And now these few days are for celebrating and resting and catching up with the rest of life that isn’t writing this novel. Thank you so much to all of you who have been and will be celebrating with me. Writing novels can be a lonely business, so my friends and readers and colleagues really make a huge difference. And celebrating all the milestones makes the entire writing process both more enjoyable and more sustainable. And now? It’s time for some more celebrating! I buried the lede in last week’s post, but I just recently finished the rough draft of my latest novel, which has the working title Beast Girl. It’s a contemporary YA retelling of Beauty and the Beast from the perspective of a female beast. “Now what?” many people want to know. This week I’ll be going back through the manuscript, checking the places I marked with brackets and going through my list of notes on things I wanted to fix. Then I’ll print the whole thing out and read it, taking more notes as I go. Once I’m satisfied I have a basically cohesive novel, I’ll send it out to my first reader for his feedback. A lot of fairy tale retellings fall into the fantasy genre (ie they have some kind of magical or secondary world element) and/or the historical genre (they are set sometime in the past). Mine is set smack in the present with no magic whatsoever. Other than that, I have no idea, given that I haven’t actually read the thing yet. This question has caused me some existential angst, from which I may never recover. But seriously, I write YA because the teen experience speaks to me. It’s such a rich time of life, filled with possibilities and discoveries and confusion and emotion. Fiction that grabs me often involves tough choices, and there are so many tough choices to be made when you’re a teenager…and often the first tough choices you’ve ever had to make. I like to have things planned out and organized, and I like to have a schedule. But I also recognize that during a creative process, things aren’t always going to work out the way I’ve planned. There has to be room for flexibility and taking advantage of what is uncovered. That being said, I generally have a daily goal of some kind, whether that be word count, page count (for revising), or time spent. At the beginning of a project, my goals tend to be a lot fuzzier, but once I start on the rough draft, things get real. I don’t have any particular writing ritual: no beverage I need to have, or a specific place I need to write, or the right mood music. I do prefer to write in a quiet place without interruptions. And I have to have a place to write that works for me ergonomically-speaking. I also like it when my dog is nearby. It can be a struggle to focus on what I’m doing, but so far I haven’t found any rituals that are particularly helpful for improving my focus. I still experiment from time to time with these sorts of things, though. I also like to have something I’m concentrating on improving while I’m writing. This varies from project to project and even within the same project. For example, in Beast Girl I was paying a lot of attention to character and voice. For Academy of Forgetting, I spent a lot of time honing in on structure and plot. And within these larger aspects, I try to drill down to smaller specifics that I’m working on. I think targeted practice is important for improving oneself as a writer. And the tour goes on…. My long-time readers know how much I fail at these kind of blog memes, and especially at tagging other people to participate in them. So it should come as no big surprise that I didn’t ask anyone to do a similar post for next week. I encourage you to go ahead and do it if the questions sound interesting to you. I often use my lack of tagging as an opportunity to talk about other blogs I’m reading right now, but I have a confession to make: I haven’t been reading many blogs lately. It’s been way too busy with the move and the novel and life. So the few blogs I’ve kept up with are the ones I mention again and again: the blogs of Rahul Kanakia, Theodora Goss, and Ferrett Steinmetz. They are such good blogs I made time for them! I’ve also been following the Youtube show Emma Approved, a modern-day adaptation of Jane Austen’s Emma, produced by the same people who did the Lizzie Bennett Diaries. It’s on sabbatical for the month of May, so now is an excellent time to catch up if you’re interested.